North American Technician Excellence (NATE) recently added some new tests to its already robust certification program. 1 One of them is an HVAC Support Technician certificate and is available to HVAC technicians who have been working in the field for 6 to 12 months. While NATE already offers a number of well known certification options with many benefits to those who earn them, this new certificate is part of a new tiered structure. HVAC techs can gain professional credentials now at different levels, whereas before the only options were master-level certification exams. 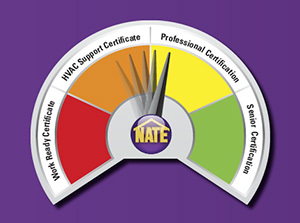 Some HVACR schools like the Refrigeration School offer a NATE Certification Exam Preparation Course, which is approved by NATE as a Recognized Training Provider and testing facility. Studying for NATE exams with the support of a vocational school can provide resources that you might not otherwise have on your own. The HVAC Support Technician Certificate covers many of the same topics as NATE’s other professional certificates but as a more fundamental skill level, making it possible to receive an official NATE credential sooner rather than later. If you pass this HVAC Support Technician exam, you receive a certificate (not certification). If you are trying to decide if taking the exam is a good idea or not, here are some considerations. Are Taking these Exams Necessary? When Should I Take the HVAC Support Technician Exam? If you already have HVAC training from a vocational institution, you should be eligible for entry-level employment. After 6 months, you are eligible to take the HVAC Support exam. Then, after two years of working in the field, you’ll be eligible for NATE Professional Level Certification, which can increase opportunities in the field, particularly because they allow for greater specialization. Before that time, if you are investing in gaining qualifications in addition to work experience, the NATE Support Certificate could be a great credential to add to your resume. It can help you reinforce your skills, it shows employers that you are dedicated to the field, and it familiarizes you with NATE testing procedures. Consider what it will requires of you in terms of time, money, and commitment, and whether the rewards are worth investing in. Taking and passing the exam certainly won’t hurt your HVAC career!